Three amazing alpine resorts along with the cosmopolitan and historic city of Boston. As you cruise along the scenic roads that link these four destinations you’ll pass typical New England scenes like covered bridges, frozen lakes and charming homes. After collecting your car or SUV, you’ll leave Boston and head north. Don’t worry, you’ll be back to enjoy Boston’s charms before you return home. You won’t drive far today, just enough to get you started on the road to the slopes of New England. Killington Mountain Resort & Ski Area is located in central Vermont. It’s the largest ski area in eastern America, and it also has the largest vertical drop in all of New England. Find out just why Killington is so popular. 141 trails, served by 22 ski lifts over 6 interconnected mountain peaks. The 3 days of skiing here will never become repetitive, as this resort has more than enough skiing to entertain you for weeks. A third and final day on Killington’s amazing slopes. This ski resort town in northern Vermont is a cute as a button, providing state off the art lifts with small town charm. In the summer months, biking and hiking take over. And come Autumn, the leaves put on a show for all to see. But for me, winter is when Stowe is at it’s best. Two mountains of classy Vermont skiing can be enjoyed over the next 2 days. And skiing in America often means open, wide and empty slopes and Stowe is no different. A skiing holiday in New England has to be experienced by every lover of the white stuff. Stowe has more than enough skiing on offer for another full day on the slopes. However, if you fancy a day of rest then Stowe is a charming place to spend the day. And if you like Ice Cream, then the Ben & Jerry’s Factory is well worth a visit. You’ll leave the Green Mountain range of Vermont for the White Mountain range of New Hampshire on the next leg of your Ski New England holiday. Wildcat Ski resort offers stunning views of Mount Washington as you cruise the down the slopes. Choose from Bretton Woods, Attitash or perhaps Canon for your last day of skiing in New England. New Hampshire‘s Mount Washington is the highest summit in the Northeastern U.S. at 6,288’ – a stunning landmark can be enjoyed from most of the state’s great ski areas. After ten days of classy skiing throughout New England, you’ll cruise down scenic roads on your way back to Boston. Smaller, friendlier and more sophisticated than most of its east coast neighbours. 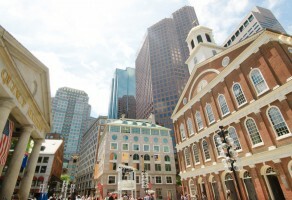 Boston is packed with history and charm, and it offers world class shopping, dining and walking tours. Wrap up warm and discover Boston one neighbourhood at a time. Highlights include Boston Public Garden, Fenway Park and top class museums. The American Road Trip Company normally try to book a late flight home for our customers, that way you can make the most of your final day in America. Why not spend the morning shopping or visiting one last Boston attraction? 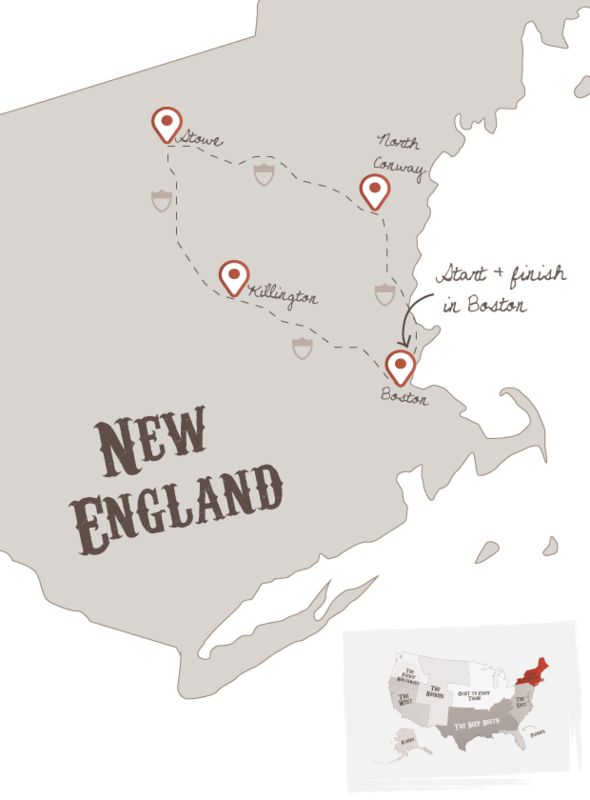 Don't forget to check out this road trip's Itinerary tab to see more amazing pictures from our "Ski New England" tour. You'll also be able to read a little bit about what you'll be getting up to on each and every day of this incredible holiday adventure.